God loves all His children – He really does! I remember when my son Josh was young (around 9 or 10) and in elementary school. He was playing on a Boy’s Club basketball team and one day he came home in a total tizzy. It seems a friend of his had gotten the latest basketball shoes. 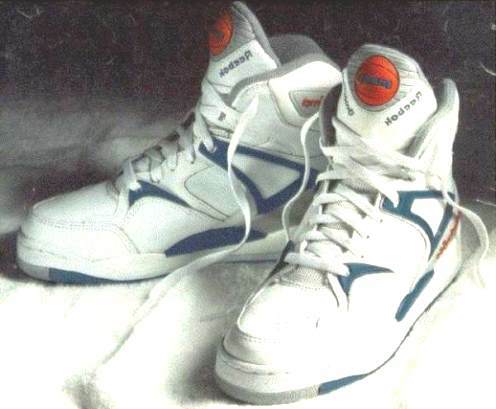 They were called Reebok Pump and they pumped up, inflating to lock around the ankle. They cost $170 (the boy told everyone, thankyouverymuch). Josh so wanted a pair to play in. I explained that $170 (in the early 90’s) was a lot for a pair of shoes he’d only wear a few months and then outgrow. Not trying to discourage, just freaking out inside. He decided he would pay for half of them. He explained that I could take it out of his savings; that’s how much he wanted these super cool basketball shoes. He also decided that he would play better if he had those pump shoes. He just knew they were supposed to make you play better – why? Because it said so on TV, of course! I did tell him that if he really wanted to pay for half of them, then it was his choice. We used the scripture in James 1:5 and asked God for wisdom and I asked him to pray about it. So we knew that when he went with his gram to the shoe store the next day, he would make good choices. I also reminded him that God knew he wanted to be ‘cool’ and He loves us. I also explained that if he got the shoes, it would be fine with me. Josh had had very mixed emotions. He wanted those shoes so badly, but he wasn’t that sure he wanted to spend almost all his money on them. The next day after school, Josh and his gram went to town to look for basketball shoes. When they got to the shoe store, Josh asked about the basketball shoes that had pumps. Much to his disappointment, the sales clerk told him those shoes were not in our small town. His friend must have gotten the shoes from a larger city down the road because they would not be in our town until later in the year. Josh sadly nodded and sat down (his gram told me the story later). He knew they couldn’t be as cool as the pump shoes. When the sales lady came back, he took his old shoes off so he could try a shoe on and slumped back down in the chair. The lady lifted the lid off the shoe box and Josh saw a red light twinkle from inside the box. He sat up quickly. Josh was so excited. Not only were these shoes cool, he would be the very first one to have a pair! He tried them on and boy! were they cool! Those lights blinked every time he took a step. He was so proud and happy, especially when he found out they were not expensive at all and were even better than the pump shoes that didn’t even have any lights! Josh learned a great lessons about God’s goodness that day – that God loves us enough to help us be cool. He learned God can do even better than you think and what you get is far better than what you wanted. God loves little details. 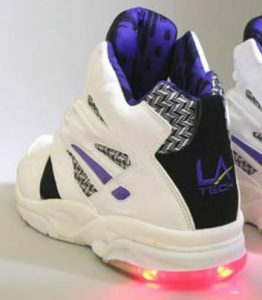 And he certainly caused a sensation since he was the only child on the court with shoes that had red lights in the heel. Win-win, only God. That is so awesome. If we only include God and talk to Him, there is no limit to what God would do for us. It’s so wonderful that God cares about EVERY detail of our lives!